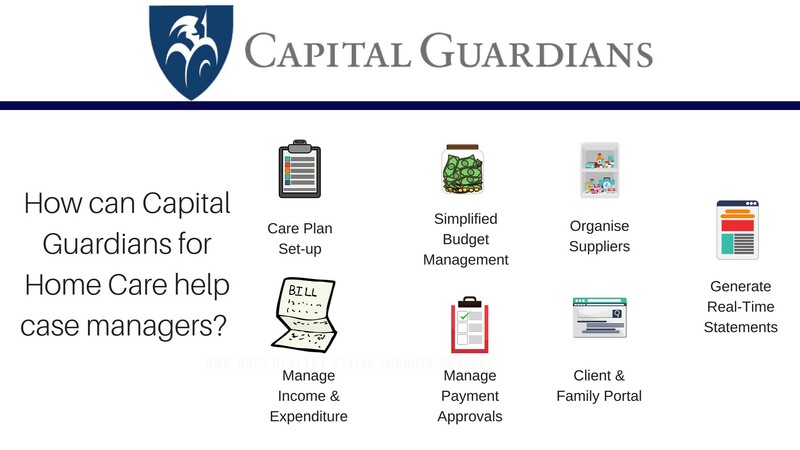 It starts with an approved provider for home care (HCP) They register clients on Capital Guardians, and Medicare subsidies are paid directly to the account by Medicare, along with any agreed contributions from an individual by direct debit from their personal account. The HCP will then create or upload an agreed budget for their client into Capital Guardians, and schedule booking for all agreed goods and services as part of the budget. Goods and service providers then invoice the HCP recipient via Capital Guardians: app, upload, email or other methods. Goods and service providers can be found with the search tools on Capital Guardians or are invited to register for invoicing by the HCP. The HCP will approve all invoices, with the budget and schedule booking for their client, and the vendors are paid every Friday. HCP’s are represented by their Case Managers (or Home Care Managers), who act as an independent care adviser, with the goal of keeping their clients in their own home, safely, as long as possible. The Case Manager will prepare a home care plan, considering their client’s needs and choices regarding the best use of the resources they have, including the package monies.